Mary Lewis presenting the SCC Chairman's Award for Voluntary Service to Adrian WitherleyLocal hero Adrian Witherley spends his Sunday mornings keeping the Tilt Conservation Area clear of rubbish. Having been born and educated in Cobham, he is proud of his community and wants to keep it in pristine condition. Adrian's efforts did not go unnoticed by David Tipping of Cobham Conservation & Heritage Trust, who lives on the Tilt. When Surrey County Council Chairman, Mrs Sally Marks, recently recognised some of Surrey's unsung heroes, Adrian was surprised to find his name on the list. 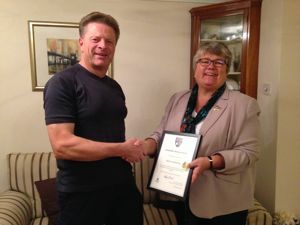 The Chairman's Award for Voluntary Service, comprising a medal and certificate, was presented to Adrian by Cobham's County Councillor Mary Lewis on behalf of the Council Chairman. Speaking about her Surrey County Council Chairman's Awards, Mrs Marks said, "It is fantastic to thank these amazing unsung volunteers and celebrate the work they do for communities." "It's a privilege and an honour to see that sense of community first hand when I travel across the county in my role as Chairman, and I am constantly moved by the selfless dedication of these wonderful people." 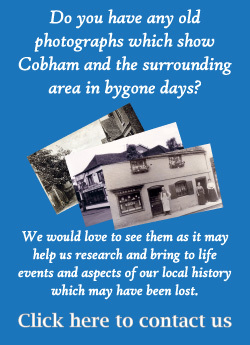 Mary Lewis added, "Thanks to the work of Adrian Witherley, Cobham Conservation & Heritage Trust and Elmbridge Borough Council, the Tilt Conservation Area is in safe hands. I was pleased to be able to nominate Adrian for an award, as he works quietly in the background but makes life better for everyone who visits the Tilt and the nearby riverbank." The Cobham Conservation & Heritage Trust have written to Elmbridge Borough Ciouncil Planning department and asked for the application to be refused. The representation detailing the objection can be downloaded and viewed by clicking here. It's good news that the Cobham Free School has abandoned its plans to develop a large new school on the Green Belt site adjoining Anvil Lane, Cobham and instead intends moving into Munro House off the Fairmile. Some years ago we argued that Munro House would be a far more suitable site! 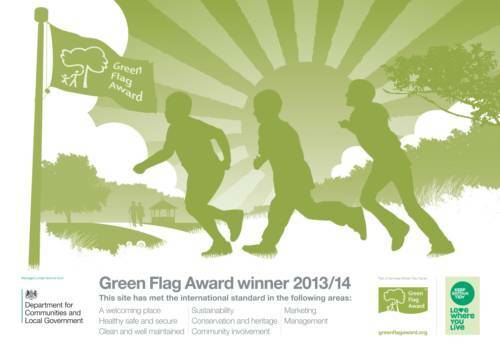 We should like to congratulate the planning department at Elmbridge BC and our Councillors who have steadfastly held out to protect our Green Belt. This sends a clear, strong and unequivocal message to other potential developers “hands off our green belt”. We would like to thank the other Cobham groups who united with us under the banner of the Cobham Green Belt Group to fight this and also for the support we have received from our members. We realise that not all our members will be happy with the new site but hopefully, with the network of footpaths and cycle lanes available, many pupils will use alternatives to the car to get to school. The developer’s application to develop 1-7 Holly Parade in Cobham High Street has now been validated and has been assigned the Planning Ref: 2016/2185. However, Elmbridge Borough Council have not yet posted on their web site some of the important documents involved. At this time the consultation period has already been extended to 9th September 2016 and we are looking for objections to be lodged by then although a further extension is anticipated. As we have said previously, the developers say that these proposals were shaped by the local community and that they have “carefully reviewed the scheme and made a number of design changes....". But those changes were entirely cosmetic and not to the size of the development, with 4 storey’s and a flat roof retained even though there was extensive objection to the size and appearance during their consultation. “Improvements” may have been made to the façade but the Trust considers that completely inappropriate as presently designed. The above drawing, which also forms part of a leaflet you may be receiving, clearly show how massive the building is and how the design is quite out of keeping with the architecture nearby of pitched roofs and gables. It is not proportionate to the current relatively small development currently there, ugly though that may be. It is difficult to provide any further explanation at this time but those are important points to identify in objection. There are subsidiary issues that really result from the size of the development such as the inadequacy of parking provision on the site and in the area. If you agree, please go online at www.elmbridge.gov.uk/planning/find-application/ and check out the detailed plans using planning ref: 2016/2185 or use this link http://bit.ly/2bDlJxm and consider lodging an objection now. The developer has now submitted an application (although it has still to be registered as of 8 Aug 2016) to develop 1-7 Holly Parade, Cobham - the empty shops in the High Street opposite Farrants. The proposed development is quite stark with a flat roof and in our view quite out of keeping with the architecture nearby of pitched roofs and gables. As soon as the application has been registered it will be published and the clock will start ticking for comments. This could happen any day now or in the next week or two. As usual we shall email the grounds on which we shall object and the points on which we shall be basing this Trust's objections. As you know the developers have carried out extensive consultations involving the community. Indeed they wrote to over 2000 residents and stakeholders and over 200 attended their meetings - more, they say, than for any previous McCarthy and Stone development. We believe that the majority who attended would have expressed deep reservations about the architectural style of the frontage above the shops and the flat roof but our evidence is only anecdotal. All those who have attended any of the meetings or responded to the developers will have received a newsletter in the last week and a reply card requesting feedback. In the Newsletter it states "...these proposals were shaped by the local community. Following the feedback we received from residents we have carefully reviewed the scheme and made a number of design changes...." this is just not true because the community would not have shaped the proposals to include a flat roof furthermore in the changes that the architects have made (and, to give them credit, these are improvements) no mention is made that they are not responding to requests for dispensing with the flat roof. For those who have received their newsletter and the feedback form and feel the same way as us may we ask you to submit the feedback form making a strong comment that you still believe that the flat roof and frontage above the shops is wrong for this High Street and pays no regards to the architecture around e.g. at Farrants opposite. We must not leave it on record that the community acquiesced with their proposals or even worse helped to frame them. Once the application has been published we shall consider it and write to our members within the timescale for objecting, with our views. Our planning team have been considering the draft Guildford Local Plan since it went out for consultation in June 2016. Members of the Trust will have already received an email providing guidance for objecting to the inclusion of the former Wisley Airfield in the plan. Comments need to be received by GBC by midnight Mon 18 July 2016. The Trust has submitted a comprehensive letter detailing why we feel the former Wisley Airfield should be excluded and this can be viewed as a PDF via this link. Thank you to all those who have written to Guildford Borough Council and made your views known.